Identification: Small, round flattened, faintly angular faces. About the size of a cherry. Base colour is green. Characteristics: The fruit flesh is yellowish green. Fine-grained and firm. Acidic. Uses: Ornamental. Also used for root stock. Origins: Native to eastern North America. Cultivation: Vigorous. Semi spur. Grows to a maximum of 6 metres. Tolerates Hardiness Zones 4 through 8. 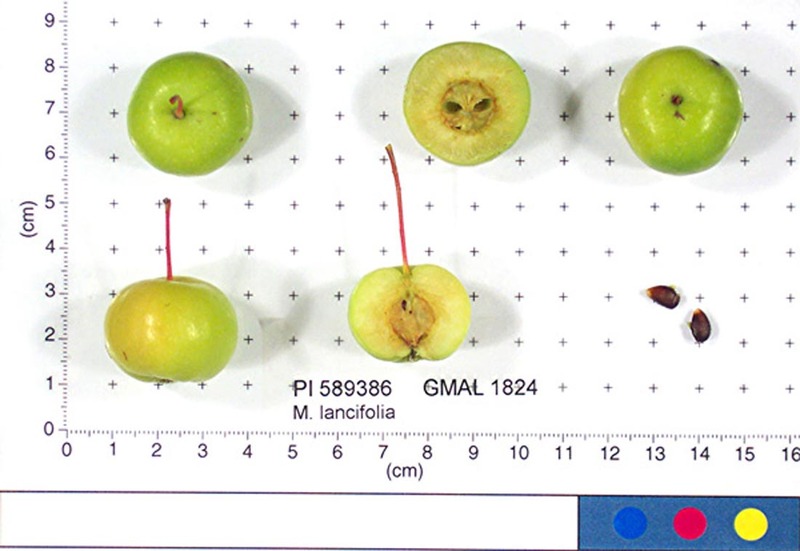 Vulnerabilities: Resistant to most apple diseases. Harvest: Matures early in the fourth period. Fruit hangs after ripening. Flowers: White with pale pink.